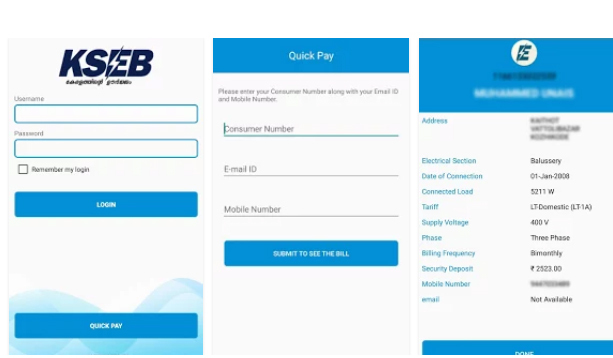 Kerala State Electricity Board has launched its official online payment facilities for electricity bills. As per the new system, the electricity bill amount can be automatically debited from the customers bank account and creditied into the KSEB account. For this the customer has to fill an OTM mandate to the Bank. A new mobile has been launched to facilitate e-payment over the mobile phone. The KSEB official app is the latest offering and self service facility for customers from KSEB Limited which extends a host of features. • Check Bill Details for past 12 months. • Check Consumption Details for past 12 months. • Check Payment History for the past 12 months. • View bill details & pay your monthly bill using credit cards, debit cards, net-banking. • Notifications alerting bill due date, payment confirmation etc. • A smart phone with Android Operating System (OS 2.2 or above). • Internet connectivity like GPRS/EDGE/3G/Wi-Fi. For queries, feedback & suggestions, kindly email us at unais@kseb.in .